Famed architect Frank Lloyd Wright, over the course of his 73-year career, designed more than 1,000 structures, including residences, hotels, office buildings, churches, museums and skyscrapers. There is a dream and hope in my heart... of erecting a synagogue... in simple and modern design that will be an inspiration for generations to come from all over the country to see it and find here a "new thing" - the American spirit wedded to the ancient spirit of Israel. ...there is only one architect-artist who could meet this challenge of so dramatic and original an idea. And that architect is yourself. As the building rose - fueled by steady efforts at fundraising - these two visionaries corresponded frequently, hashing out details and negotiating necessary concessions. 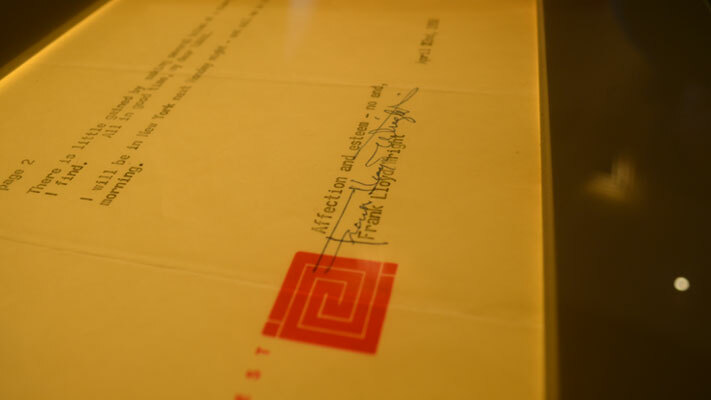 Wright did not witness the September 20, 1959, dedication ceremony, having passed away five months prior, at age 89, from complications related to abdominal surgery. Today, the edifice on which Cohen and Wright worked so tirelessly stands as a beacon, as much an artistic expression of multiple interpretations as an active house of worship. According to docent Helene Mansheim, the dual character of the building is exactly the point. "It&apos;s art," she says. "So people come and see and interpret for themselves. Which reflects the Wright point of view. But that uplift of spirit is all directed toward God. Which is the goal that Rabbi Cohen dedicated his life to." Mansheim&apos;s point about the architecture being open to differing views is evident throughout the property. In viewing the edifice from the street, for example, questions immediately arise: Is the distinct shape a mountain, crafted to mimic Mount Sinai? Is it a tent, reminiscent of the 40 years of wandering in the desert? 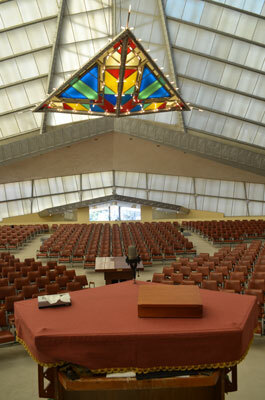 Within the synagogue, a colorful chevron hangs from the ceiling. Is it an interpretation of the rainbow that followed the great flood? Or is it Joseph&apos;s coat of many colors? In any case, Mansheim points out that the subtle symbolism is intentional. "The seats here are arranged in a delicate slope; the floor is not level," she cites. "On a practical front, it was designed to ensure that all the sight lines were good, that everyone can see. But the feeling it creates was intended to make the congregation feel as if it is being cupped in God&apos;s hands." The downward grade also hints at the desert hillsides that were often the setting for public discourse in Biblical times, a feature highlighted by the carpet&apos;s sandy color. Perhaps the most striking feature of the synagogue is its impressive shell. The construction material was innovative for its time, a dual layer of glass and Plexiglas. ...Mr. Wright came to Philadelphia to give his word on the proposed scheme for the glassification of the Tower. He decided on the sanded white glass, wired and corrugated. When asked why he preferred the plain white glass to the amber, actinic glass, he answered: "Since this is to be God&apos;s Temple, I prefer to have Him color the glass." Among its many members is Josh Shapiro and family. His affection for this community is plain: "Beth Sholom is my spiritual home and has been for 37 years. It&apos;s a solemn place of worship, an architectural landmark, a welcoming environment and a key historical site in Montgomery County. It&apos;s part of the fabric of who I am and what makes our community great. Whether you are looking for fellowship, faith or architectural splendor, please visit Beth Sholom," he says. 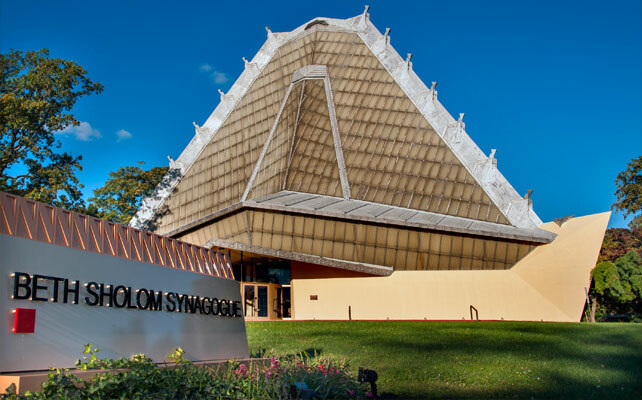 Guided tours of Beth Sholom Synagogue begin at the onsite visitor center, open Wednesdays and Thursdays, 10 a.m. to 1 p.m., and Sundays from 1 p.m. to 3 p.m. Guests start with viewing a 20-minute video on the site&apos;s history (narrated by Leonard Nimoy), followed by a one-hour experience of all it has to offer.